ScienceDaily (Aug. 17, 2010) — In findings that push back the clock on the scientific world's thinking about when animal life appeared on Earth, Princeton scientists may have discovered the oldest fossils of animal bodies, suggesting that primitive sponge-like creatures were living in ocean reefs about 650 million years ago. The shelly fossils, found beneath a 635 million-year-old glacial deposit in South Australia, represent the earliest evidence of animal body forms in the current fossil record by at least 70 million years. In future research, Maloof and his collaborators intend to refine their three-dimensional digital reconstruction technique to automate and increase the speed of the process. This could have a significant impact on paleontology, enabling the analysis of myriad early fossils that are currently inaccessible to the tools of modern science. Previously, the oldest known fossils of hard-bodied animals were from two reef-dwelling organisms that lived about 550 million years ago -- Namacalathus, discovered in 2000 by John Grotzinger's group at the Massachusetts Institute of Technology, and Cloudina, first found in 1972 by Gerard Germs of the University of Cape Town, South Africa. Additionally, there are controversial fossils of soft-bodied animals that date to the latter part of the Ediacaran period between 577 and 542 million years ago. These fossils were first observed in the 1940s by Australian geologist Reginald Sprigg, and the oldest evidence to date of undisputed Ediacaran animals -- organisms called Kimberella -- was found in sediment about 555 million years old in Australia and Russia. Princeton geosciences professor Adam Maloof and graduate student Catherine Rose happened upon the new fossils while working on a project focused on the severe ice age that marked the end of the Cryogenian period 635 million years ago. Their findings, published in the Aug. 17 issue of the journal Nature Geosciences, provide the first direct evidence that animal life existed before -- and probably survived -- the severe "snowball Earth" event known as the Marinoan glaciation that left much of the globe covered in ice at the end of the Cryogenian. "We were accustomed to finding rocks with embedded mud chips, and at first this is what we thought we were seeing," Maloof said. "But then we noticed these repeated shapes that we were finding everywhere -- wishbones, rings, perforated slabs and anvils. By the second year, we realized we had stumbled upon some sort of organism, and we decided to analyze the fossils. No one was expecting that we would find animals that lived before the ice age, and since animals probably did not evolve twice, we are suddenly confronted with the question of how some relative of these reef-dwelling animals survived the 'snowball Earth.'" "These scientists have found that animals may have appeared on Earth 90 million years earlier than previously known," said H. Richard Lane, program director for the Directorate for Geosciences of the National Science Foundation's Division of Earth Sciences, which funded the research. 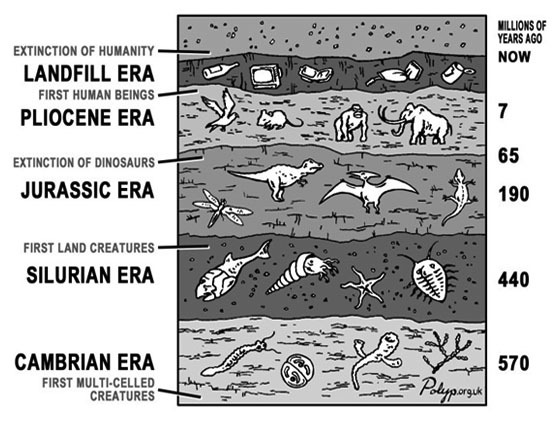 "This is comparable to resetting modern times to begin during the late Cretaceous." Analyzing the fossils turned out to be easier said than done, as the composition and location of the fossils made it such that they could not be removed from the surrounding rock using conventional techniques, nor could they be imaged using X-ray scanning techniques. This is because X-rays are only able to distinguish between materials with different densities, which is why they can be used to image bones that are inside the human body or buried within a rock. But the most ancient skeletal fossils are made not of bone, but of calcite -- the same material that makes up the rock matrix in which they are embedded. Therefore X-rays could not be used to "illuminate" the newly discovered fossils and the researchers had to develop and refine another method. Maloof, Rose and their collaborators teamed up with professionals at Situ Studio, a Brooklyn-based design and digital fabrication studio, to create three-dimensional digital models of two individual fossils that were embedded in the surrounding rock. As part of the process, team members shaved off 50 microns of sample at a time -- about half the width of a human hair -- and photographed the polished rock surface each time. The team ground and imaged nearly 500 slices of the rock. Using specialized software techniques developed specifically for this project, the researchers then "stacked" the outlines on top of one another to create a complete three-dimensional model of the creature. The technique is similar to the way in which CAT scan technology combines a series of two-dimensional X-rays to create a three-dimensional image of the inside of the body. The technique that was developed served to automate the process -- turning a prohibitively time-consuming task into an efficient and effective method for fossil reconstruction. "For Situ Studio, the most exciting aspect of this collaboration is that we were able to successfully employ knowledge developed within an architectural practice to help solve problems in an entirely different field -- applying design tools to spatial problems on a completely different scale," said Bradley Samuels, a founding partner of Situ Studio. "It became an exercise in marrying disparate bodies of knowledge to address pressing questions in the geosciences." When they began the digital reconstruction process, the shape of some of the two-dimensional slices made the researchers suspect they might be dealing with the previously discovered Namacalathus, a goblet-shaped creature featuring a long body stalk topped with a hollow ball. But their model revealed irregularly shaped, centimeter-scale animals with a network of internal canals. These critters looked nothing like Namacalathus. After considering a variety of alternatives, the researchers decided that the fossil organisms most closely resembled sponges -- simple filter-feeding animals that extract food from water as it flows through specialized body channels. Previously, the oldest known undisputed fossilized sponges were about 520 million years old, dating to the Cambrian Period. But evidence has suggested that sponges appeared on the scene much earlier in Earth history. For example, scientists have conducted detailed analyses of genetic material in a wide range of organisms to create "molecular clocks" that suggest how long ago a given species evolved. According to these clocks, sponges existed millions of years before the Cambrian. This has been supported by the relatively recent discovery of lipid biomarkers -- essentially, traces of recalcitrant fats that resist degradation over millions of years -- in sedimentary rocks from Oman of nearly the same age as those studied by the Maloof group in Australia. "For many years the great Marinoan ice age has formed a hard floor to the fossil record of animals, even though most molecular clocks suggest a deeper history, at least for sponges," said evolutionary biologist Andrew Knoll of Harvard University, who was not part of the research team. "Adam and his students are digging deeper and finding that there is much to catch our attention in pre-glacial carbonate rocks … . I'm convinced that the structures Adam's group have found are not simply shards of material, formed and deposited by purely physical processes. That said, it isn't easy to be sure what they are. Adam's group has carefully spelled out the biological alternatives and built a reasonable case for interpreting the structures as sponge-like animals. At the very least, this should drive paleontologists back to the field to seek similar or better evidence in other rocks of comparable age."